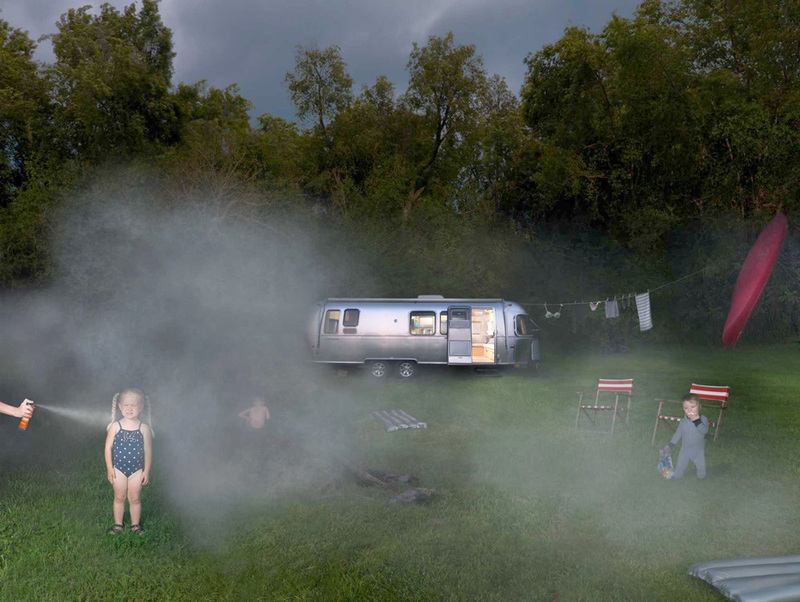 Julie Blackmon’s photographs of unsupervised children, including “Airstream” (2011), are at once pleasurable and discomfiting. Courtesy Catherine Edelman Gallery, Chicago. Matt Bollinger’s paintings, including this diptych, “Independence I & II” (2016), are emotionally dense with the pathos of family and memory. Courtesy the artist and Zürcher New York/Paris. 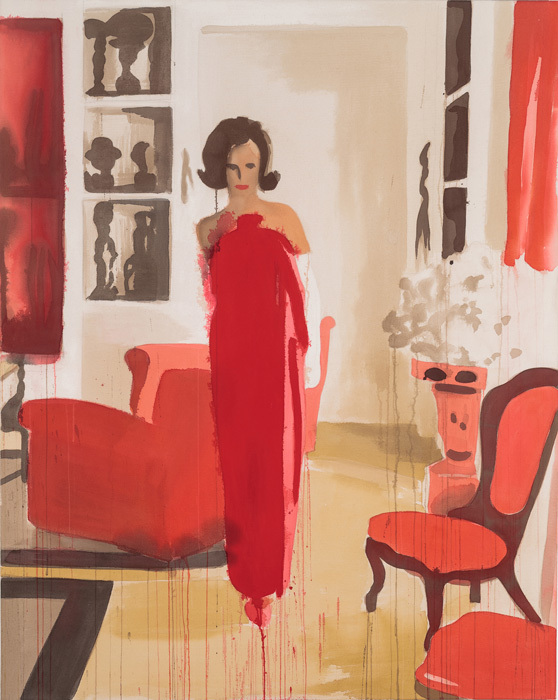 Liz Markus paints society women in abstracted interiors, as seen in “Lee Radziwill in Lanvin” (2014), a work in acrylic and pencil on unprimed canvas. Collection Philip and Julia Brown, New York, New York. Nerman exhibit peers behind the facade of American normalcy. Themes of memory, loss, disaffection, and personal/political anxiety run through the Nerman Museum’s “Domestic Seen” exhibit featuring works by seven artists from New York to L.A. Drawings, paintings, photographs and films tell stories that reach beyond the domestic net that contains them here and resonate with larger cultural and economic issues facing American society. Some of the seven examine sentiments surrounding family, home, and “domestic” as it relates to labor and immigration. Others explore discursive and even mythic modes of storytelling that reflexively focus on the process of image making and sometimes peripherally on something domestic. Matt Bollinger, a Kansas City Art Institute graduate, creates large-scale unstretched canvas and paper paintings whose acrylic paint and flashe facades call attention to surface while creating an illusional three-dimensional depth that amplifies content. “Storage” shows the front of a car that’s been backed into a garage or storage unit. The tight space is congested with shelves, wood, tarp and other detritus one might find in any similar space. That the car — so vividly present — solidly confronts us feels personal and meaningful. The bright shaft of light that rakes the left side of the painting imbues this car in this space with a certain solemnity, and the tarp draped across the front suggests that there is unfinished business. Bollinger is known for his autobiographical paintings, and “Storage” may refer to his father’s car-part business, which, like many family-owned businesses, was shuttered by the crushing impact of big box stores on small businesses. “Dad’s Home Office” features an empty desk chair rolled back from the edge of a desk where a cigarette still burns in the ashtray. Light from the computer illuminates the chair seat, focusing attention on its owner’s absence. This and Bollinger’s other paintings are emotionally dense with the pathos of family and memory. In unpeopled graphite drawings of quotidian spaces and things, Sean Lyman expresses here-and now-ness, of how we are simultaneously present — traces of human activity are in every piece — and absent. Despite their exquisite detail, these shadowy drawings of bathrooms, hallways, sinks and toilets are dreamlike and secretive. Why is a bathroom stall door detached from its hinges? What has happened or is about to happen behind half-opened doors? Or what is down that hallway? Lyman’s drawings are concrete images of place, and yet psychologically charged spaces of illusion and poetry. Dialectics of inside and outside co-exist, as we are visually inside these confining and tautly drawn spaces, and yet we exist physically and psychically outside of them. Drawings, paintings, photographs and films tell stories that reach beyond the domestic net that contains them here and resonate with larger cultural and economic issues facing American society. Ramiro Gomez excavates the labor of undocumented immigrants through slickly executed paintings of Los Angeles-based homes and high-end stores like Fred Segal. In the monumental “American Gardeners (After David Hockney’s American Collectors, Fred and Marcia Weisman 1968),” Gomez inverts the celebrated British artist’s attention to the wealthy couple and paints instead the unnamed gardeners and workers who immaculately maintain the property. Tom Kiefer’s part-time janitorial work at a U.S. Customs and border station in Arizona informs his “El Sueño Americano (The American Dream),” a photographic display of illegal immigrants’ confiscated and discarded belongings. In large color images Kiefer captures dozens of soaps, wallets, gloves, water bottles and other items that were seized during illegal border crossings and thrown out by customs agents. The groups of items are painful to see, as they are sad stand-ins for their owners. Yet the photos’ studied artistry — the soaps and wallets are artfully arranged to be visually appealing — diminishes their potential political impact and dilutes the documentarian element crucial to the series’ effectiveness. His aesthetic of loss, to borrow a phrase from writer bell hooks, may seem to fetishize, and therefore undermine, personal and collective suffering. Springfield, Mo. artist Julie Blackmon’s unnerving hyper-realistic photographs of children in various stages of leisure suggest the many weird things about being a child: disorganized play and home life, the strange ways we come together with family and neighbors, and an often-chaotic family environment. Blackmon’s photographs feature no adults (or only their legs), lending a messy sensibility to these photos, as if the children precariously ramble about or play in a pool with no adult supervision. In “Night Movie,” children are scattered around the dark back yard while “The Sound of Music” is projected onto a huge screen. The scene is the pivotal one where the Captain performs “Edelweiss” for his mesmerized children. Only two of the children in Blackmon’s photo are similarly mesmerized. The rest wander the back yard, play, or stand in front of the projector, creating a silhouette on the screen. It’s a touching and funny scene. Liz Markus’s paintings of society women C.Z. Guest, Lee Radziwill, Slim Keith and others posing in highly abstracted interiors, are a sharp contrast to the more contemplative work in the exhibition. Markus relies on old magazine spreads for her root imagery, abstracting and breaking down the elements in the room, from the furniture to the clothing to the figures. The women, painted in minimal gestures on unprimed canvas, which allows the paint to bleed, drip, and spread, feel as temporal as time and fame itself, in a critique, perhaps, of the way celebrity culture invades our domestic spaces. Ezra Johnson explores the formal relationships between paintings and films, straddling and uniting the spaces between, creating a circular journey. 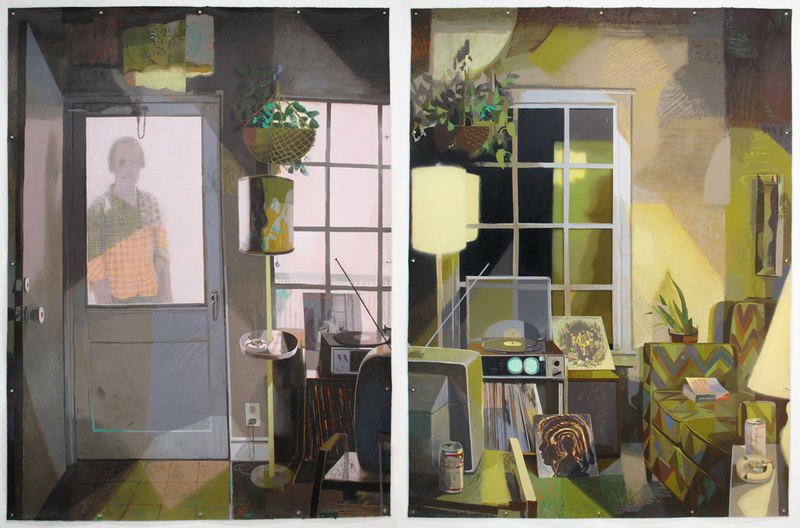 In the short film “Stranded in a House,” a morphing, abstract painted figure oozes across interior photos Johnson has culled from catalogues and magazines. Johnson continually constructs and deconstructs the figure throughout the film, emphasizing the figure’s and the medium’s plasticity. The confluence of paint and animation disrupts specific narrative, instead creating a disjointed poetic journey that exists outside of any relatable measurement of time and place. The figure acts upon the interiors, blobbing across the photographed pages, while the soundtrack of footsteps and other ambient noises helps to push the figure along until the film and the figure’s denouement. “Domestic Seen” continues at the Nerman Museum of Contemporary Art at Johnson County Community College, 12345 College Blvd., Overland Park through March 26. Hours are 10 a.m. to 5 p.m. Tuesday, Friday, Saturday; 10 a.m. to 8 p.m. Wednesday and Thursday; noon to 5 p.m. Sunday. Closed Monday. For more information, 913.469.3000 or www.nermanmuseum.org.